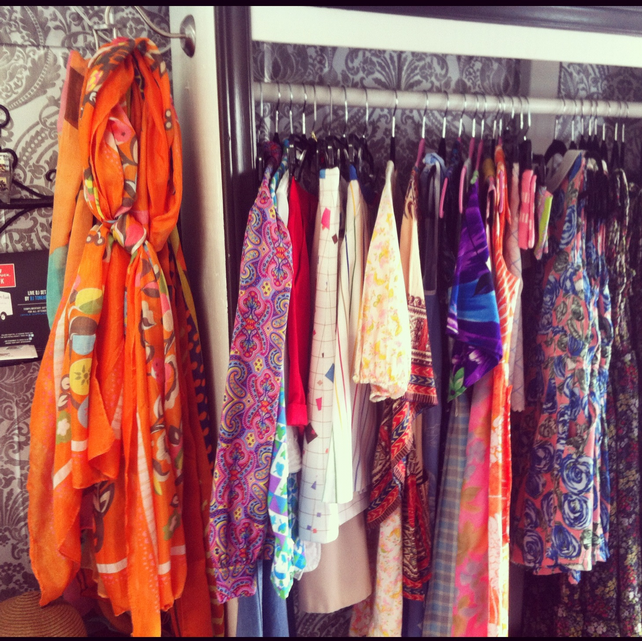 Le Fashion Truck: Weekly Fashion Review: Corals and Florals! 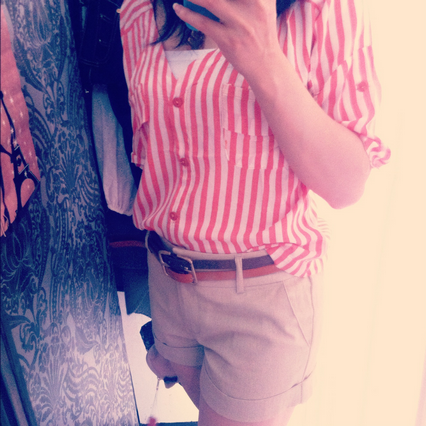 Weekly Fashion Review: Corals and Florals! This week's fashion review is brought to you by guest blogger Chalsea Chen. We had the pleasure of working with Chalsea last Saturday at The Venice Meet for a segment we did with Rai.tv. Two fashionistas, one idea. As Stacey Steffe, one of the co-founders of Le Fashion Truck, put it, “we love fashion and we saw the food truck, then we asked ourselves, why can’t we combine the two and create a fashion truck?” Here we go! Le Fashion Truck was born. Instead of you going to the fashion, the fashion now can come to you. Why shop at the Fashion Truck? If you have never been to one of the Le Fashion Truck events, you are totally missing out on the newest LA fashion shopping experience. Having been to a number of Le Fashion Truck events, I’m always amused by the different surprises. Why? Because it’s the whole experience of community shopping! You will never know what to expect, whether it’s the fashion inside the truck, the live band that’s playing on the spot, or the assortment of vendors that show up. It’s almost like Night Market in Asia (if you don’t know what I’m talking about, check it out here: Night Market). All right, let’s begin with my most recent visit of the Le Fashion Truck at The Venice Meet this past Saturday. Located at 1010 Abbot Kinney Blvd right by Venice beach, I’ve already indulged myself in the sunny morning drive and the fresh sea breeze. As soon as I walked to the event, I felt like I entered a happy land: live music, local vendors of organic butter, skateboard makers, art, food, and most importantly fashion. So, what does it feel like to shop on the wheel? Walking right up the cute little stairs of the Le Fashion Truck, you will be warmly welcomed by both Jeanine Romo (the other co-founder) and Stacey. 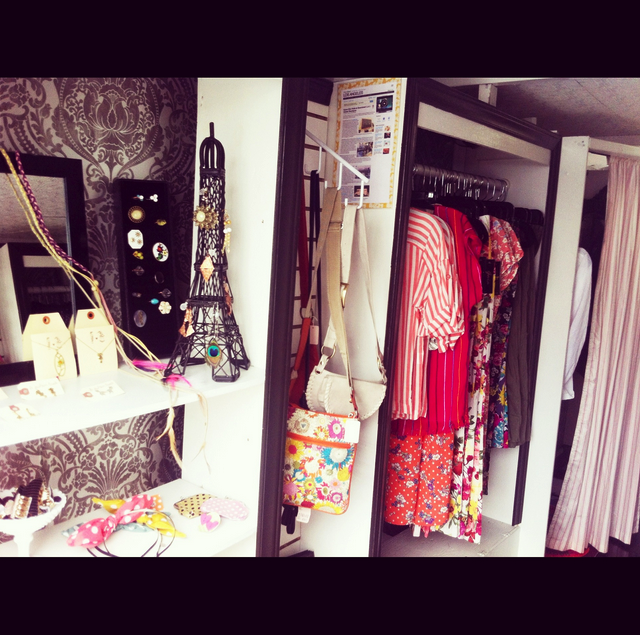 It is so much fun to shop inside a fashion truck. First of all, you walk up to the cute little pink stairs. Once you get inside the truck, you will feel like Alice in wonderland. You will see accessories on both your left and right hand sides. Getting into the middle of the truck, it is the clothing section which displays both vintage and the latest fashions. On the left corner you will find a cute fitting room! Yes, can you believe that? At the end of the truck is the counter. To see a snapshot of the fashion on the wheels, check out the Instagram pictures at the end of the article. The top is super comfortable because it’s made of light, soft cotton. The brown and orange belt just perfectly matches the shirt and shorts, which brings together a whole new look. I can’t imagine them separately. A pair of blush pink heels is subtle and yet balances the simplicity of the blouse and the vividness of the pants. The 45% white with 45% pink/yellow, and 10% blush pink is such an adorable and pretty combination. You can wear this outfit to all kinds of occasions: girls’ day out, teatime in the afternoon, picnic at the park, daily wardrobe, or a visit to museum. Don’t forget to follow LeFashionTruck on Twitter and Facebook. More importantly, check out the Le Fashion Truck calendar to see where the next stop is! If you happen to be in DTLA this Friday, don’t miss the Fashion Friday in DTLA. It’s located at FIG AT 7TH! Are you planning on something fun to do this upcoming Saturday? Check out their next event with Broke Girls Guide. BGG is hosting a “Girls Day Out” at the Apt2B Pop-Up event. 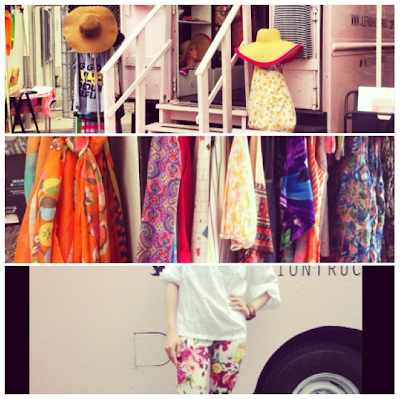 During that day, Rai Italian TV was filming a segment with Le Fashion Truck. From left to right: Jeanine Romo, Me, Stacey, make up artist Brandy Rabone. 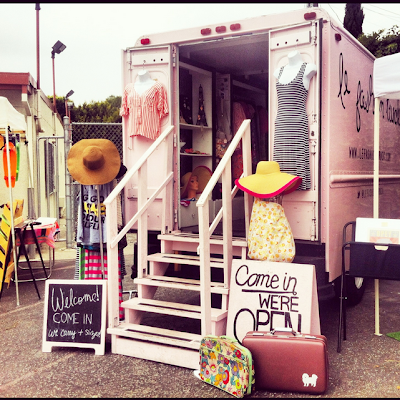 Le Fashion Truck is the first Mobile Boutique in LA. The truck launched on Jan 13, 2011, but the company started in October 2010. You won’t believe how funny it was one time a customer ran into the fashion truck and asked, do you guys sell food here? But for people who are into fashion, this is the best ‘food’ you can buy at the event. Follow @ChalseaChen for more fashion updates.